UMD starts the 2019 season undefeated with a pair of wins against rivals NDSU and Minnesota. The UMD Men’s Lacrosse team started the 2019 season with a pair of hard-fought wins against fierce rivals. The Dogs took down defending national champion North Dakota State in their season opener and beat the University of Minnesota the following week in an overtime thriller. The wins earned UMD the number one spot in the MCLA DII national rankings, and project an exciting season ahead. On Friday, Feb. 15, the Bulldogs trekked west across Minnesota to play NDSU in Fargo, N.D. The Bison were an insurmountable hurdle for UMD last season, beating the Dogs three times, including in a season-ending loss in the semifinals of the MCLA National Tournament in Salt Lake City. This left a sour taste in many mouths and also left no doubt that this game would be contesting. The Bison took the lead early but UMD fought back with six goals in the second quarter to put the Bulldogs up 8-6 going into halftime. The game then went back and forth until the final whistle when UMD came out on top with a score of 13-11. Freshman goalie Ethan Skophammer made his presence known with 11 saves in his opening game. Juniors Josh Huttunen and Jared Johnson took control on offense, each scoring four goals. NDSU was the top-ranked team going into this game. 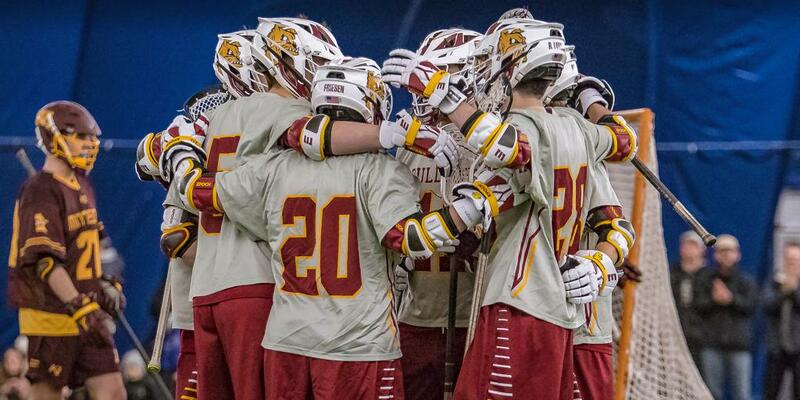 The win would thrust UMD into the top ranking in the MCLA DII Coaches Poll. The following week, on Sunday, Feb. 24, UMD went toe to toe with their historic rival, the University of Minnesota Golden Gophers. Temperatures felt like a bitter -15°F outside the STMA Dome but on the inside the Bulldogs offense was hot. They scored nine goals in the second quarter making the halftime score a seemingly conclusive 12-5. In the following two quarters, the Gophers crawled back with multiple stretches of unanswered goals. With about two minutes left in the fourth quarter, Minnesota evened the game at 16 with a man-up goal. The game went into overtime, where on the Bulldogs’ first possession junior Ryan Larson dodged down the alley, beat his defender and scored on a low shot to give UMD the win. It was Larson’s fourth goal of the game. Senior Scott McNamara and freshman Matt Friesen were a definitive force on offense, each scoring three goals. Junior Blake Barta took control on faceoffs, going 24-9 at the X. The Bulldogs now have about two weeks to prepare for their next set of games which will be played in Nashville, Tenn., on March 9 and 10. UMD will first play Florida Gulf Coast, then face Kennesaw State of Georgia, and Central Connecticut State the following day. Be sure to follow UMD Men’s Lacrosse on Facebook, Twitter @DuluthLacrosse and Instagram @umdlacrosse for all the latest team news and updates.